Remember Strawberry Shortcake? I think it was a huge fad in the 80's (in fact, my sister's first birthday party theme was strawberry shortcake). But it is now slowly making its comeback, now with a revamped look. We have received lots of orders for strawberry shortcake designs. 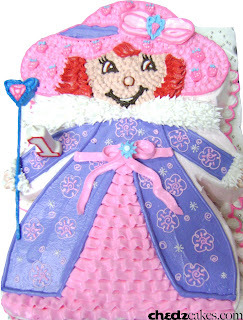 This is one of the more popular designs: the cake shaped and decorated to look like the character (classic version).